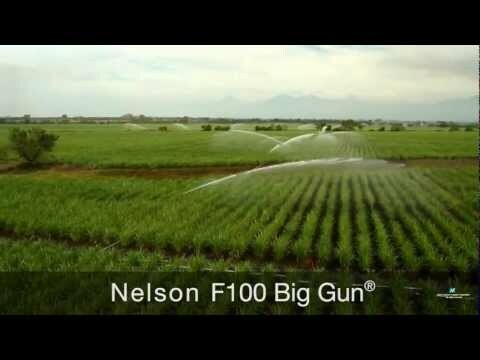 Nelson Irrigation offers a full range of water application solutions for the irrigation of sugarcane. Choose 3000 Series Pivot Products and Pressure Regulators for center pivot or linear applications, R33 Rotators for portable set applications and Big Gun sprinklers for solid set or traveler irrigation. Combine with 800 Series Control Valves and ACV200 Air Control Valves for optimal system performance. The Center Pivot or Linear is widely used to irrigate sugarcane and represents a cost-effective, laborsaving solution. The Nelson R3000 Rotator delivers the highest level of uniformity in combination with the widest throw of all sprinklers mounted on drops. The O3000 Orbitor offers lower pressure operation and resistance to plugging. The S3000 Yellow Plate Spinner offers a combination of lower pressure operation and lower trajectories for wind resistance. All Nelson pivot sprinklers are mounted with the Nelson single strut pressure regulator, an innovated design that significantly reduces plugging upstream of the regulator. Where portable hand move sprinkler irrigation systems are used, the R33 and R33LP Rotators offers significant advantages. The elimination of riser vibration allows the sprinkler to be mounted on taller risers. The compact design reduces breakage during daily pipe moves. The Rotator technology delivers high uniformity of water application. Big Guns used on portable irrigation systems are often operated for 2000 hours a year. The Nelson Big Gun has the reliability to handle this duty. Portable systems are moved several times a day. The Nelson Big Gun has the strength and durability to last in this tough working environment. Traveling Irrigators are a form of mechanized irrigation often used to irrigate irregularly shaped fields that are not suited to center pivot or linear systems. Hours of use per year are high and water quality is often poor. No filtration is required and the design of the Nelson Big Gun ensures reliable operation.